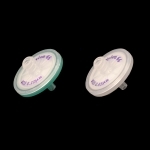 Nylon disposable syringe filters made from high density polypropylene with standard inlet (female luer lock/luer tip) and outlet (male luer tip) connections, non-sterile. Hydrophilic nylon with broad chemical resistance, extremely well suited for aqueous or organic sample prep, HPLC, GC and dissolution sample analysis. Excellent flow rates and high throughput loading. Universal application for analytical procedures. Chemical Incompatibilities: Acids >1N, halogenated solvents, proteineous Samples with high non-specific binding affinities. 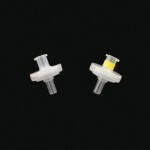 Diameter: 13mm. Pore Size: 0.22um. Filter Area: 10.3mm/0.83cm2. Pressure: 13mm/100psi. Temperature: 25C-80C. 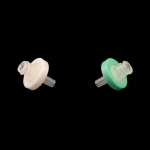 Diameter: 13mm. Pore Size: 0.45um. Filter Area: 10.3mm/0.83cm2. Pressure: 13mm/100psi. Temperature: 25C-80C. Diameter: 25mm. Pore Size: 0.22um. Temperature: 25C-80C. Diameter: 25mm. Pore Size: 0.45um. Temperature: 25C-80C.